For half a century Rio has been a chic getaway for people from all over the world. No wonder why, as this large city and former capital of Brazil sits on one of the world's most magnificent harbors surrounded by the most extraordinary beaches. Rio is not only lovely, it's also lively. "Cariocas", as natives of Rio are called, are fun loving people who live to celebrate their proud heritage. Rio's cultural diversity combined with its over 400-year history is contrasted by the city's modern, cosmopolitan flavor. This provides visitors with a unique atmosphere that is exclusive to Rio - and an opportunity to experience the cultural riches, historical wonders, lively nightlife, fashionable shopping and phenomenal international cuisine of one the world's most dynamic and scenically captivating destinations. It's all available 24 hours a day. 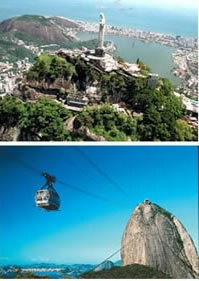 RIO-5, "The Best of Rio"
In addition to these regular excursions from Rio de Janeiro City, we also offer a series of special Interest Tours in the state of Rio de Janeiro.